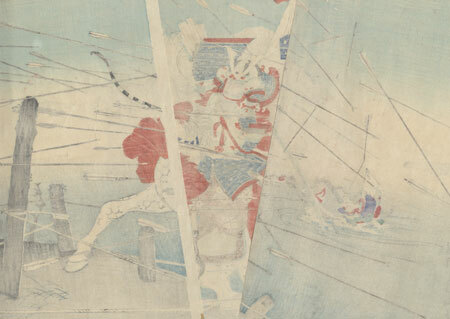 Comments - Dramatic scene from a famous episode during the Second Battle of Uji. 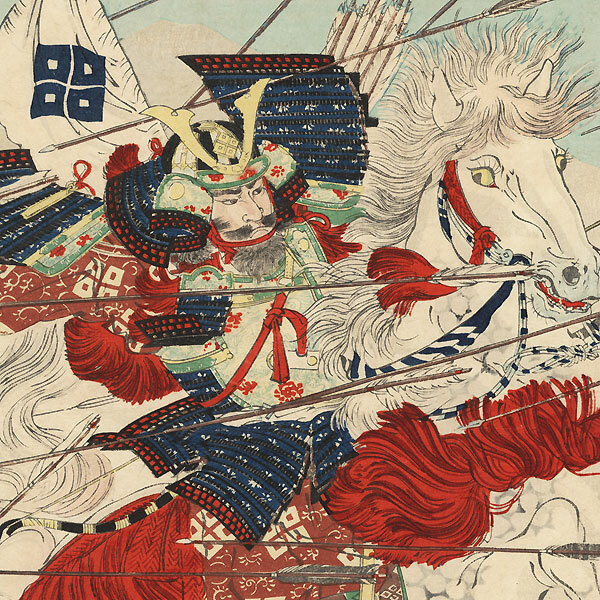 The Minamoto warrior Sasaki Takatasuna races across the Uji River on the Shogun Yoritomo's white horse in a contest with fellow warrior Kajiwara Kagesue to see who could engage the enemy first. Sasaki reaches the bank first, galloping ahead under a hail of arrows, gripping his sword firmly, the horse's mane and tail flying in the wind. He slices through the arrows with his sword, cutting them in two in mid-air. Kajiwara follow behind, leading his mount through the chest-deep water. An incredible, dynamic design, with the large figure and lively horse taking center stage, the arrows adding a sense of movement and speed. Beautifully detailed, with fine shading in the water and sky. A classic samurai subject. Condition - This print with excellent color and detail as shown. Three separate panels. Adhesive residue on reverse at corners from previous mounting. Small loss at corner, a few small holes, repaired. Slight soiling, a few spots. Please see photos for details.